This is a recipe I took from Country Woman March/April 1994 edition and have used it ever since. This is a great Sunday lunch meal served over toast. 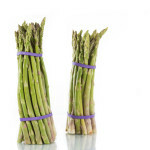 In a saucepan cook asparagus in a small amount of water until tender, drain and set aside. In a medium saucepan, mix cornstarch and 2 tbsp. milk, add butter, salt, pepper and remaining milk. Cook and stir over medium heat until the mixture thickens and bubbles. Add parsley, ham, eggs if using, cheese and asparagus. Cook and stir over low heat until the ham is warmed and cheese is melted. Serve over toast points or biscuits.